Microsoft has long since abandoned XNA improvements, but that doesn’t mean you have to stop using the framework entirely. If you’re interested in installing the XNA framework on Windows 8 and 8.1, it can be a little tricky. Follow these steps. If you are installing the Windows Phone SDK 7.1, re-run setup and choose to repair it. This will re-run the previously failing XNA Game Studio installers and they should install correctly this time. If you are install a standalone XNA Game Studio product, re-run setup and it should install correctly this time. If you are planning to do Windows Phone development, you should also install the Windows Phone SDK 7.1.1 Update after installing the Windows Phone SDK 7.1. This update fixes an issue that prevents the emulator in the Windows Phone SDK 7.1 from working correctly on Windows 8. If you are installing the Windows Phone SDK 7.1, you can use the log collection tool to gather your setup log files. This log collection tool will create a file named %temp%\vslogs.cab. This method may not be entirely legal, so only try it at your own discretion. 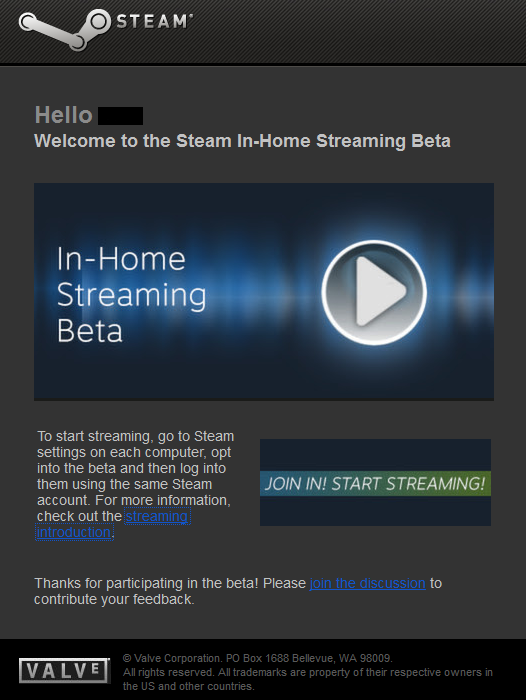 Valve has launched the initial phase of beta testing for their new Steam In-Home Streaming service. I have no clue how many people go into this first phase, but I was lucky enough to get invited. I was at work today and casually checked email from my phone. To my excitement, this popped up in my inbox. If you got invited, then you will likely receive a similar email. It comes from the address “noreply@steampowered.com” if you’re curious. It doesn’t ask for any usernames, passwords, or any other Steam information, so don’t fall for any scams that people try to send you. The email will have links to a Steam Support article with answers to some common questions, how to get setup, and how to get additional help. I highly suggest reading the support article and visiting the main streaming page. All my tests are going to be with mouse, keyboard, and touchpad (on the laptop). I don’t have a proper controller to test controller input. Honestly, reading the support article linked above would probably suffice, but that’s so boring. Don’t you want to follow along with someone who is in the beta? Sure you do! Here’s what I did to get setup. Get two computers capable of launching the Steam client. In my case, I have a desktop which will host all of the games and a laptop which will connect to the host as a streaming client. The host and client operating system doesn’t seem to matter. My desktop is running Windows 8.1, but my laptop is running Xubuntu 13.04. The connections worked perfectly fine. Make sure both computers are on the same local network so they can see each other. I’m using a relatively dated router (see The Gear section above), so my latency results are going to be on the low end if I’m going up against people with gigabit networks. Both computers are connected to the router via CAT5e cable. Login to Steam on each computer, go to Steam –> Settings and opt-in to the Steam Beta Client. Restart Steam, and you should see the following pop-up in the lower right (once both of your computers are connected to Steam). The pop-up actually shows up on both computers indicating who it is connected to. In fact, there is a separate pop-up for disconnection as well. 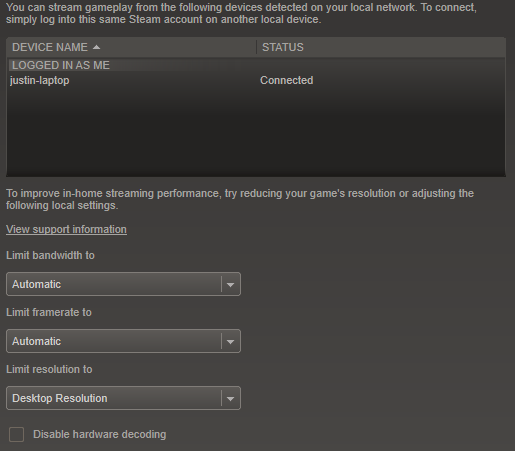 Confirm the connection by going to Steam –> Settings –> In-Home Streaming. You’ll see the devices that you can connect to along with a bunch of streaming settings (see below). The concept of rendering to a virtually sized target is labeled as “Logical Size” in SDL2. Rendering a game to a logical size makes the scaling of that game to match different window sizes much easier. Imagine that we created our game under the assumption of 800×600 (an old school, 4:3 aspect ratio). On a user’s machine that has their system resolution set to 1920×1080, we have two choices: 1) show the game in a tiny window or 2) stretch the picture to fit the full screen. Both of these options are pretty terrible. In the first, the window will be too small to see anything useful (depending on the textures and fonts used in the game). In the second, the stretched picture will look awful because the aspect ratios do not even match. This is where SDL2’s logical rendering comes into play. After establishing your renderer, all you really need to do is call the SDL_RenderSetLogicalSize function with the appropriate parameters. 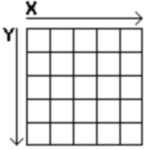 For example, the below code will set the logical rendering size to 800×600. Now whenever we use our renderer to render textures, they will be appropriately scaled to fit the window size and letter-boxed to avoid the ugly stretched look of different aspect ratios. You can see this in action in the picture below. In this example, I am rendering to a logical size of 800×600 in a window of size 1400×900. Note the letter boxes that SDL2 added to the left and right to avoid stretching. A common feature of applications and video games is to allow the player to input text for various reasons. Maybe we want to allow the player to input their character’s name in an RPG, name a city in SimCity, or type a chat message to a friend in online. Using SDL2, we can take advantage of its built-in text processing system which abstracts much of the operating system event handles and character encoding mechanisms. On consoles such as Xbox and Playstation, text input is rather simplistic and limited to visual keypads that you select via the controller. On a PC, we have the full range of widely varying keyboards from English and Spanish to Russian and Japanese. If we want our game or application to attract users on an international scale, it’s probably in your best interest to learn here and now how to use SDL2 to accomplish this goal. At first glance, it probably seems simple to process text input. If the user presses the ‘A’ key on the keyboard, the OS will send an event that the keyboard was just pressed, the key was ‘A’, and no modifier keys were pressed (CAPS, SHIFT, CTRL, ALT, etc…). That’s it, right? Unfortunately, there are a ton of languages on this planet, and some of them have thousands of characters in them. People who type in those languages most certainly do not have thousand-letter keyboards or entire walls of their houses dedicated as a giant keyboard. This basically means that some characters will require multiple key presses just to process. Fortunately, SDL2 handles all of this for us and simply sends us a byte array with the results. I recently created a library named SharpTiles that is heavily based on Nick Gravelyn’s TiledLib. Both libraries will allow developers to load maps from Tiled Map Editor. 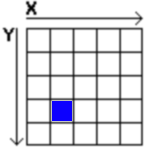 However, TiledLib is based around XNA while SharpTiles is based around SharpDL (an XNA-like game framework for SDL2). I will discuss more about SharpDL in another post, but you can refer to the simple code in this post to learn how to render a map with a small subset of the library. You can draw a map by looping through all TileLayers (layers which containd textured tiles) and all Tiles within the layers. Make sure to check if the tile is empty before drawing it. 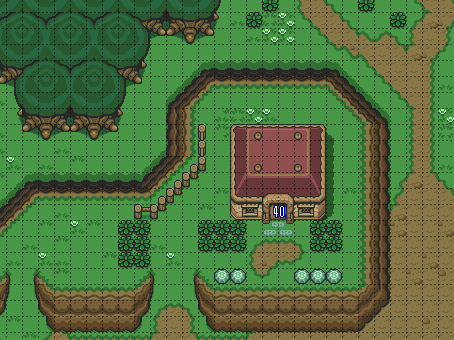 Tiled Map Editor will create empty tiles in spots that contain no textured tiles within the layer. I have confirmed that everything below works for Visual Studio 2013. Links updated to the latest release (2.0.3). The Simple DirectMedia Library (SDL) version 2 has been released after a long time in development. It seems that the author has more time on his hands and more corporate backing from his new position at Valve Software. I’ve heard that they use SDL for various small time projects that don’t require heavy rendering. Even so, SDL does a formidable job at making things easy. I wrote this guide under the following setup, but I’m sure that it can be applied to other version of Windows (and maybe even Visual Studio). OK, the ugly project setup is finished. Now we can have some fun with coding. Now add a new cpp file with this code. I released the first update to the Steam Community Viewer Windows 8 application. Search for it in the Windows 8 Store or view it here.